Here is a great Guerrilla Marketing Idea to try. If is called the 72 Hour Bounce-Back Gift Certificate. It is simple and elegant. You have a small wallet size card that you or your server present to a customer at the end of their meal. 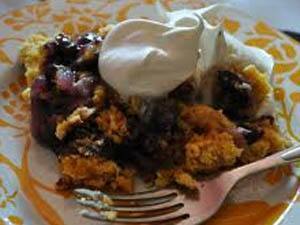 It makes an enticing offer to your customer if they return to your restaurant within 72 hours. You know your restaurant and guests best, so pick an offer you think suites your restaurant and patrons. 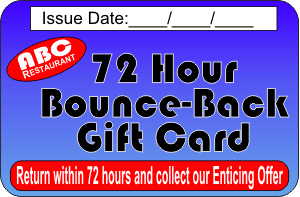 "We really appreciate your business and would like to invite you back to our restaurant with our 72 Hour Bounce-Back Gift Certificate." The psychology here is: 1) to get your guest in the habit of coming to your restaurant and 2) embedding your establishment's name in their mind. "Remember: We are creatures of habit. Psychology plays a big role in restaurant marketing." This offer is time limited by it's very nature. It is easy to setup and implement. There is no advertising cost associated with this program other than the cost of your offer (be it a 2 for 1, free dessert with entree etc.) and the price of the cards. You are free to pick and choose who you extend this offer to. All you need are a few pages of the print-it-yourself business cards, available at all of the office supply shops, and your office computer. Print up the basic card leaving an area for the date you give the card to your guest. You are already to launch your promotion. As with all promotions and campaigns, it is very important to figure out how you are going to track this offer in your establishment. Pick a number of cards, say 200 for arguments sake, and then count how many get returned. Perhaps you give them to a new guest to encourage them to return, or you may use this promotion to reward regulars. The important thing is you will see patrons returning and spending money in your restaurant.